Part of the mystery of expressions is the vocabulary of the technical language. What exactly is an array? What’s the difference between a method, an argument, or a statement? What do all of these things do? I admit that those were a bit intimidating when I first started learning about expressions and coding myself, so I thought that I’d put together a handy list of expression definitions to help de-mystify things a bit more. Some methods can be used in multiple places, like the wiggle() method. Others need to be applied to only specific properties in order to work. For example, the lookAt() method can only be applied to a layer’s orientation property in order to work correctly. Likewise, returns can be nested within other methods or mathematical operations in order to produce even more complex results. As I stated a moment ago, methods require arguments in order to return a value. An argument is a value that is used by a method to produce a return (see above if you need those terms redefined). Some arguments can be very simple, requiring only a single number, or can be very complex, requiring a 5-dimension array. With complex arguments, syntax (or the method of arrangement of those values) becomes critical. Strings – Strings are text. When the user needs to input a string, the user does so by writing the string within single or double quotes. When After Effects produces the string the quotation marks are not present. Sometimes the string will be used to refer to a certain layer, layer attribute, or effect parameter. Other times, strings will be used to produce text on the screen. Be aware! Strings need to be written precisely – even a misplaced capital or lower case letter, as well as a misspelled word, can cause a fault in the expression. Numbers a number is considered to be a single numerical value. That’s it, nothing fancy. Each value is called a “dimension,” and theoretically there is no upper limit on the amount of dimensions that an array can contain. Practically speaking, however, there are no arrays that are larger than 6 dimensions use in After Effects. Boolean – True or False values. Usually, you will need to write out the word specifically. Lastly, operators are symbols that tell After Effects to run mathematical operations on numbers or numerical values within arrays. By definition, operators cannot work on strings or booleans, since they are text. Examples of operators are +,-,*,/, etc. All of the code that I wrote above are examples of statements. Statements are executable lines of code, ending with a semicolon. Often, statements simply access attributes or parameters and return that value to the property containing the expression. Some statements assign variables, however, while other statements use methods and operators to calculate values, or even set conditional statements. Now that you know the definition of these terms, I hope that your expression research and work becomes a little bit easier! In the previous three posts, we took a look at the internal workings of real cameras and their counterparts in the After Effects virtual cameras. We now shift our focus to the external workings of camera movements and how to achieve those same results in After Effects. In part four, we will examine how to use the Orbit Null to achieve more predictable results when looking at a static or moving subject. Creating a Camera Orbit null is very easy. 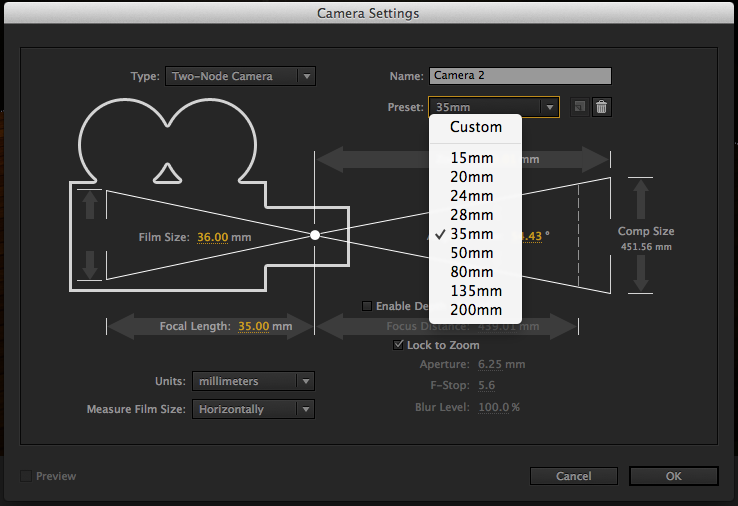 Create a camera in the comp, and select Layer>Camera>Create Orbit Null in the menu bar. That will create a new null object, and parent the camera to the null object. This means that any transform property changes that you make directly to the camera will be made relative to the null object, NOT relative to the 3D world in which the camera exists. On the other hand, any changes that you make the the null object WILL be relative to the 3D world. Additionally, the cameras point of interest will always be the null object, and any movement that you make directly to the camera will result in a reorientation of the camera toward the null object. This may not always be desirable. There are times when you want to have a dolly effect on the camera without reorienting the camera toward a specific point. In that case, 3D camera nulls are NOT the solution in your project. On the other hand, if you are orbiting the camera around a moving object, and want to have an easy means of doing so, then the Camera Orbit Null may be just the trick for you! Controlling the position and rotation values of the null object affects the camera. Do you want to spin the camera around your subject? Then change the rotation values of the null object. Do you want the camera to move with the subject (if the subject is moving)? Then alter the position values of the orbit null, or add an expression linking the position values of your subject to the position values of the orbit null. If you wish to change the distance of the camera relative to the orbit null however, you’ll need to change the position value of the camera itself. Usually this will involve changing the z-position value to move the camera closer or further away from the null, but it is possible to move the camera to the left or right if you choose. You can also control the camera settings as we have learned previously. Parenting the camera to the orbit null will not change their operation in any way. Set-up – No expressions and a stationary camera. The white rectangle moves forward and to the right, orienting itself along its motion path (this was done using the “orient to path” option in the auto-orient dialogue box). The camera and the orbit null remain stationary, with the camera raised slightly so that we can see the motion of the rectagle. This will serve as the basis for further explanations. If you want to set up the camera to be a “chase camera”, then use the expression found here (credit to Dan Ebberts or Motionscript.com) in the orientation value of your Orbit Null. Assuming that the subject of your camera is auto-oriented along its motion path, then that expression will link the orientation of the orbit null to the subject. From there, you can animate the camera however you wish. There are MANY other ways to use orbit nulls, but hopefully this explanation helps you to come up with some creative ideas of your own! One of the most important, and under-appreciated, technical aspects of photography is depth of field (DoF). Most people refer to it as “blur,” although computer media artists know that “blur” can mean much more than DoF. Simply put, DoF is the amount of area around the subject that is in focus. It separates foreground and background from the subject by causing a the foreground and background to appear out of focus, or “blurry.” The greater the DoF, the more things are in focus. The less the amount of DoF, the fewer things are in focus. Most photographers describe that quality as “bokeh.” This can be used in any number of ways, but the most common is to separate the subject from the background and/or the foreground of an image. There are also artistic reasons to consider, and we’ll look at those as well. Since photography deals with light and with optics, having an understanding of how light responds as it enters the camera is necessary to truly grasp how our digital counterparts will respond. There’s a fantastic discussion of that, complete with graphics, sliders, and mathematics, at this website, but for the sake of brevity I will simplify the discussion here. I would encourage you to visit the website and play with the web applet. It makes things clearer when you can see the changes for yourself as you control them. DoF is determined by three functions of a camera’s lens – aperture, focal length, and focal distance. As light rays enter a camera’s lens, they do so from many directions. The smaller the focal length, the wider the aperture, and the closer the subject, the greater the angle that light can enter the lens. Conversely, the greater the focal length, the smaller the aperture, and the more distant the subject, the lesser the angle that light can enter it. It is this directionality of light that determines the DoF. No, I promis that we’re not discussing Apple Software. In each camera lens, there are the glass elements that allow light to enter and strike the recording media, but there are a series of metal leaves that snap into place when shutter opens. These metal leaves, called the Aperture, control how much light enters the camera, where as the glass elements control HOW light enters the camera. (Click here for a GREAT applet that shows the balance between aperture, shutter speed, and sensor sensitivity in determining exposure). Typically, there are between 5 and 7 “leaves” (or “diaphragm blades”) in a lens, but there are some lenses with more and some with less. Telephoto lenses will typically feature more leaves than wide-angle lenses. Likewise, lenses with large glass elements will also have more leaves. Aperture has the most noticeable effect on the size of the DoF, but it does not operate alone. The focal length of the lens also plays a large role in determining Depth of Field. Longer focal lengths increase the length of the lens and decrease the directionality of the light entering the lens. As we discussed before, with the increase in the directionality of the light, comes a greater DoF. Since focusing involves moving the glass elements of the lens, changing the focal distance of the subject relative to the camera (by either moving the subject or the camera itself) will also increase or decrease the length of the lens, with the concurrent changes to the DoF. 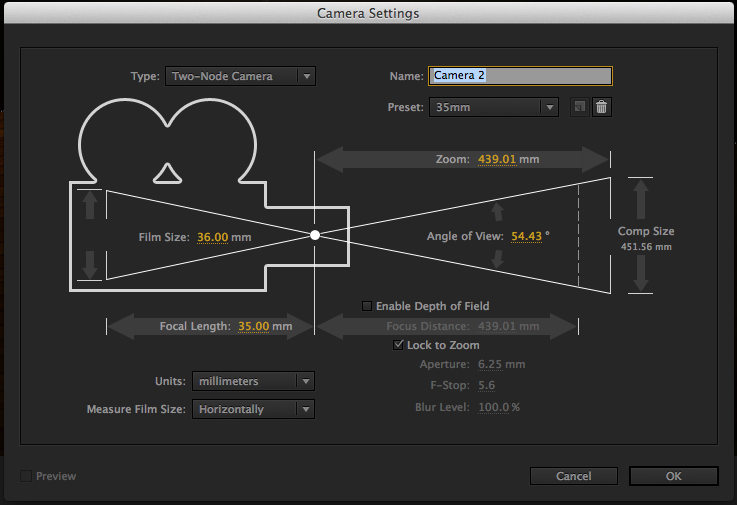 In After Effects, virtual cameras function much the same way that real world-cameras do. There are a few descriptive differences, but the functions are essentially the same. Of course, there are also some things that a virtual camera can do that a real-world camera cannot. So let’s take a look. Depth of Field in After Effects cameras is either switched on or switched off. Obviously if it is off, playing with camera settings will do nothing to affect DoF. The settings will be animated if you choose to do so, but there will be no change in either your preview or your final render. On the other hand, if the setting is switched to “on”, then those changes will appear in preview and final render. In After Effects, remember that all measurements are done in pixels, no millimeters like standard photography. Focus Distance and Aperture use the same terminology as real-world cameras, but the number of aperture leaves receives the label “Iris Shape”; the iris is the hole created by the aperture leaves. A triangle is created by three, leaves, a square by 4, and so on. Beyond that, there are a number of options that do not have real-world counterparts, and deserve some attention. In photography, you cannot control the amount of blur after it has been generated by the lens elements. In After Effects, it is possible to control the amount of blur using the “Blur Level” control. 100% means that blur will appear as it would in a real-world camera, and it can be decreased accordingly by percentage. The iris rotation allows you to rotate the virtual iris leaves within the virtual lens. It theory it is possible to simulate this with a real-world camera, but it would be expensive and technically challenging to do so. Iris roundness functions much like the roundness settings for shape layers. Going back to the real-world for a moment, when aperture leaves move into place, they create vertices where they cross in front of each other. Rounded aperture leaves avoid creating those vertices. But unless the user switches lenses, there is currently no way to control the amount of roundness at will with a real-world lense. After Effects, however, is under no such constraints. Use the the Iris Roundness setting to soften up some of the edges of your iris. Lastly, Iris Aspect Ratio (IAR) controls how the virtual aperture leaves move together to form their shape. With an IAR of 1.0, the AE camera assumes that all aperture leaves will come together equally, forming a circle. The IAR describes an x:1 ratio, in the case of the default settings a ration of 1:1. As the IAR value gets higher, the shape becomes an oval of increasing width. This can generate some rather interesting results in your DoF! To the best of my knowledge, there is no camera that can alter it’s IAR “on the fly” like the virtual cameras in After Effects can do. Focus distance changes as focal length and aperture are unchanged. Changing the aperture on a camera with a fixed focal length and fixed focal distance. Putting it all together! Testing various aspects of the After Effects virtual camera – alone and in concert. Values are shown on the right as the animation progresses. Focal Length and Focal Distance are not complex things to understand, and animating them over time can add a lot of dynamism and dramatic flair to a project. So, for your viewing pleasure, I’ve included several examples using telephoto lenses, a wide-angle lenses, and zoom lenses. First, an explanation of what those things are and how we measure focal length in the real world. Focal distance is the distance between the camera lens and the subject, and can be manipulated by the photographer – move the camera toward or away from the subject. Fairly simple and straight forward, I’d say! The focusing ring, controlled by the photographer, allows the photographer to tell the camera “Hey – this is where the subject is!” It doesn’t actually have to be where the subject is – a lot of REALLY cool photographs have the foreground in focus with the subject and background out of focus. It’s really up to the photographer and his/her artistic decision making. In videography, it’s possible to start with the focus on the foreground and shift the focus back to the subject. Again, it’s all up to the photographer/videographer. Focal distance will be important for a later topic, but I thought it worth mentioning here as well. Focal length, however, takes a LOT more time to discuss. Focal length in the real world is the distance between the light convergence point after the light hits the lens and the sensor plate of the camera (or film plate for film cameras). Focal length also has the added benefit of widening or narrowing the field-of-view (FOV) of a camera. Thus, shorter focal length lenses have a wider FOV, and longer focal length lenses have a narrower FOV. Shorter focal length lenses also widen subject features as the camera gets closer to them. Likewise, longer focal length lenses tend to compress the subject. Finally, with film and digital cameras using real lenses, the focal length is measured in millimeters although some VERY old lenses use centimeters and inches as their units of measure. In Adobe After Effects, it is measured in pixels and the corresponding FOV angle is listed parenthetically beside it. In the presets, however, focal length is given in millimeters. There are two main types of lens construction, and two main types of focal lengths with several subcategories beyond those. For our purposes, I will discuss a few at length and mention the others in passing. Lens construction is described as either prime or zoom. That means, respectively, that the lenses have a fixed and unchanging focal length, or that they are capable of having their focal length changed by the photographer. Changing the focal length from shorter to longer gives the impression of zooming in closer to the subject, hence the name. Since the FOV is narrowed as the focal length increases, the amount of subject background that we see is also further reduced. That has practical implications for cinematographers and as we plan our shots as motion graphics artists. Categorizations for focal length are mainly wide-angle and telephoto. The dividing line between the two is the 50mm mark. 50mm is said to most closely mimic the proportions of human sight. Wide-angle lenses are lenses with a focal length of less than 50mm. Typically, the prime lengths are 35mm, 28mm, 24mm, and 18mm. Wide-angle zoom lenses can fill in the gaps between those measures. Telephoto lenses are lenses with a focal length of 50mm or more. Typically, the prime lengths are 50mm, 80mm, 105mm, and 135mm. Telephoto zooms can, once again, fill in the gaps between those measures. The obvious question is, if zooms can fill in the gaps, then why bother with prime lenses? The answer is that it takes more mechanical “stuff” to move the lens elements in zoom lenses, so there is less room for the optics (glass elements). That means that there’s less light entering the camera, increased exposure times, etc. Prime lenses can have larger optics because they don’t move. Thus they can provide more light to the sensor, reducing exposure times and giving photographers other options (which we’ll discuss later). There are some extreme wide-angle lenses (called “Fish-eyes”) shorter than 18mm, that provide some very interesting looks to your photography. These are typically used for special effect, and are not widely used by the average photographer. Likewise, there are Super-Telephoto lenses beyond 135mm that are used by nature photographers and sports photographers to get close to the action while standing at a distance. Again, these are not typically used by the average photographer. The Canon EF-S 500mm f/4 L IS USM II lens retails for over $10,000 – far beyond even a prosumer’s budget! Watch this from 0:54 onward for a very cool demo of one of the world’s longest telephoto lenses. So how does this apply to us in Adobe After Effects? Certainly, we are not limited by real-world concerns like light sensitivity, optics, mechanics, etc. But understanding the real-world roots of our settings can lead us to make more intelligent decisions in our motion-graphics work. If our aim is to make our compositing, our motion graphics, our kinematic typography, etc., fit into real-world footage, then knowing the real-world counterparts to our digital tools is essential. We can also set up our own camera with our own settings by clicking on the “custom” option, or by selecting a preset and then fiddling with the settings. Likewise, we can also change the unit of measure from millimeters to either pixels or inches down in the bottom left of the dialogue box. Since I got into the visual arts through photography, I prefer to work with millimeters, but if you prefer to work with pixels or inches, please be my guest. Use whatever allows you to create great work the easiest! Focal length is now called “Zoom” here, and Focal Distance label is unchanged. Notice also that the FOV is also included in the Zoom property. Here are a few examples of the same shot with different focal lengths, including two zooms. Use of a camera is almost expected now in any motion graphics project, but understanding physical cameras is fundamental to making informed decisions about how we use the virtual cameras in After Effects. In this series, we will examine the history of cameras, discuss the fundamental principals of camera design and see how those fundamentals are mirrored in After Effects. Finally, we will discuss tools for moving cameras around in the After Effects environment, as well as the 3D Camera Tracker and stereoscopic camera rigs. The earliest camera was the Camera Obscura, whose basic operating principles were known to the ancient Greeks and Chinese. The Obscura was essentially a darkened room where a small hole was placed in one wall allowing light to enter and hit a wall opposite the hole. The major limitations of the Obscura? It was very difficult, if not impossible, to turn an entire room to face the direction you wished. Also, portability was an issue – how does one transport a room from one place to another to another. Those problems were easily solved by the use of mirrors that allowed light to enter from the ceiling – a mechanism was then added to allow the mirror housing to rotate. Further, lenses and smaller boxes were developed, but all were limited by the inability to record the images. That was solved by the development of photosensitive materials and the development process, a technology that was refined, but essentially unchanged, until the advent of digital sensors and digital photography beginning in the 1980’s. Recently, pinhole camera and rudimentary camera-based photography has emerged a specialty art form, proving the resiliency of the technology and a certain desire for ” delayed gratification” on the part of artists. Additionally, the hardware of photography has been largely unchanged since the early days. The process is essentially the same – have a box with a photosensitive surface and a hole that allows light to enter it. Like the recording media, hardware was developed and refined over time. Prime length lenses gave way to zoom lenses, manual focus was replaced by automatic focus, etc. Likewise, shutter speeds got faster and body styles and “preview” systems improved. The most transformational development was the single lens reflex camera with interchangeable lenses and integrated light meter, made most memorable by the legendary Canon AE-1. Further developments were, more or less, variations on that particular theme. Many aspects of real cameras are incorporated into the virtual cameras used in all computer graphics software packages. They are meant to imitate and simulate as closely as possible the attributes of real cameras. Since motion picture footage comes from the real world, and special effects must match what is seen in the footage, it is essential to have virtual cameras that mimic their real world counterparts. This series is an exploration of those cameras, and it is hoped that by understanding the corresponding attributes between virtual and real cameras, greater results can be achieved for all motion graphics artists. *You do not see placeholders for lights, cameras, or otherwise invisible objects in your scene. This is helpful if you want to get a sense of what your final render will be. *Stored in RAM, stops rendering preview frames when RAM storage has reached its limit. *You see placeholders for lights, cameras, or otherwise invisible objects in the scene. This is helpful if you want to see how those objects are moving around in the scene. *Initially frames are stored in RAM as the preview renders out, but are stored on scratch disk as additional frames are rendered when RAM has filled. I hope that this breakdown enables you to make more informed choices as you select which preview is best in a given situation! There are many ways to control an animation using the tools that Adobe has provided in After Effects. In today’s tip, we’re going to take a look at three: keyframes, expressions, and a layer’s In Point. Keyframing can work when you have a few complex animations to make that are not easily described by an expression. It also works when you wish to have direct control over an animation. The drawback, however, is when you wish to make any changes. If the changes made affect any major component of your animation, you may find yourself going back and tweaking every single keyframe. Multiply this over the number of tweaks you are likely to make to get something just right, and you can see where things might bog down. On the other hand, if you are working within very defined parameters, it might just do the trick! Changing the In point of a layer, however, is useful for when you have a large number of layers of the same or similar type following a same or similar expression, and when you want to have precise control of exactly when the layers enter the comp. By creating your original layers with the appropriate effects, keyframes, and/or expressions, and then duplicating them as your needs require, you can have multiple instances of the same layer beginning at different points in your composition without the need to manually move keyframes or write complex expressions. To position the layer, simply click on the layer that you wish to position, and drag it to the time where you wish to see the layer begin. To make things even more simple, put the Current Time Indicator (CTI) at the frame where you wish the layer to enter the comp, then click and hold the layer, press the shift key, and drag the In point near the CTI. The layer will then snap into place at the CTI. See the animation attached to this post for an example of a comp using all three techniques listed above. 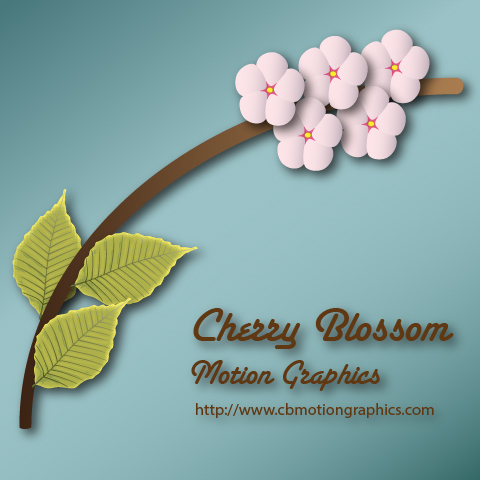 The tree branch growth was made using keyframes on motion paths, the cherry blossoms were made using multiple instances of the same layer animated in by changing the layer’s In Point, and the breeze was made using a Wiggle Expression on distortion points using the Puppet Pin and Puppet Starch tools.